Ive had this since they were reissued. It came from Creative models in Cambridge. I tried getting one for a while. I built 2 of these in the past , one was standard Nasa the other was a Moonraker one with LED engines and cockpit , once built they are VERY impressive. This one is the latest reissue , but its still hard to get in the UK. The fit on the original issue fuel tank was a bit poor. The halves were warped and took alot of hard work to get them together straight. Luckily this latest issue doesnt seem to have the same problems. I got the halves together with mr cement liquid glue in about half an hour. Thats the hardest part of the build done first , just need to rub it down and try to match in the textured parts. I like the box art too. Heres the tank. Thats a large 500ml Halfords can in the photo. Can i buy it when its done ? How badly do i want one of THESE?!?!?! Will be watching THIS build! see what i mean they take up vast amounts of room. Now thats a nice little collection. will see if i can find any photos of my old one but i have a feeling they are gone forever. I found one of the Moonraker one. Forgot to ask: what`s in the bay of this one?!? Its got the communication satelite , bio medical satelite , pallet with telescope assembly , air lock assembly and space lab assembly. Im not installing them but i might build the cargo bay and display it seperately. I have been looking at close up photos of the foam coating on the tank and its nowhere near as rough as it is on the model. Luckily that means i can rub the whole tank down and cover it with a kind of textured paint. I have decided that this shuttle will be Endeavour. 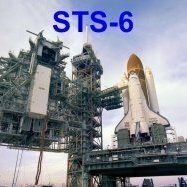 I have a really nice mission sticker on the way from the US for STS-111. I will be fixing this to the base along with 2 LEDs for spotlights shining up at it. I filled the entire top half of the tank and rubbed it backed down. I then sprayed several coats of filler primer on it. It now has a subtle texture. If you look at the before photo you will see how coarse the original finish was. Will follow along for tips on this one. Lookin' good, I build the Monogranm kit a few years back, being a Shuttle fan, I finished my model as Colombia pre the crach but post the refurb. all the windows closed up and plugs in the reaction jets. Pint wa mostly Tamya from the can, in the end I was quite happy with it. I think I would have prefered the Revell kit with all it's tile detail. I'll follow your build with interest, it's looking impressive so far..
A little more progress. The tank is done it just needs painting now. Shuttle fuselage halves joined. Plodding on.All of the large assembly work has now been done. Next up is a marathon sanding/filling task , although i have assembled it carefully so theres not alot of huge gaps. Everything will then be in grey primer before painting starts. Luckily mostly aerosol cans. Heres the external tank and boosters. The boosters are not attached yet. That aerosol can is a LARGE Halfords can. Heres the orbiter. It needs filling and sanding. It also needs the cockpit fitting and cargo doors adding. I'm surprised you found an example without the fit issues on the bottom of the tank. On both my last builds, I just ended chopping out that rear internal bulkhead with a Dremel tool and a cutoff wheel and they flexed into the proper shape just fine. I believe the reason why the fit is so bad down there is due to how the tank halves are packaged with one sitting inside the other, flexing out its sides a little (especially on the bottom). I know you'll do a good job with this. Your Moonraker stack was the inspiration for doing mine. Everytime I walk into the next room to watch the tele, I see the thing sitting on top of the entertainment stand and it is a BIG and impressive monster. Its a real honour to know some of my work inspired someone elses. The last 2 i built had those fit issues too. This one seems to be different. Maybe its better plastic , or been handled better than the earlier issues. Funnily enough the shuttle has very little filler on it too , mind you i havent fitted to doors yet and i know they can be a pain. Little bit of an update.I managed to get it on its stand. The way the stand is designed means the models lean in to each other. The decal for the base arrived from the US too. Nice stack so far, keep on the great work. Will you use tile decals? That's impressively and satisfyingly large.. Love the Moonraker one too..
Must say, that's a lovely 70's shade of orange. Great so far , any new pics ?